The Sony Xperia SP is an LTE enabled NFC smartphone that runs Android 4.1. 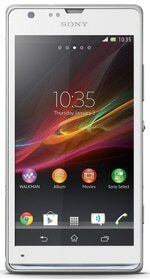 Marketed as offering “high-definition entertainment in a premium design”, the aluminium framed Xperia SP features a 4.6-inch 1280 by 720 pixel screen and a 1.7 GHz dual core processor. As with the Xperia L, it features an 8MP camera with Sony’s Exmor RS sensor. The Xperia SP includes Sony’s One Touch system, which can use NFC to display content on a TV or to share music and photos between devices. The Xperia SP was announced on 18 March 2013, and is due for worldwide release in the second quarter.